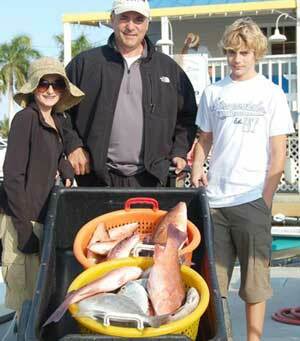 We are now into the new year and yet Naples fishing remains hot. The cold fronts before Christmas caused the Gulf of Mexico waters to cool and when that happens snapper fishing heats up. We are catching limits of mangrove snapper, red Grouper and Amberjack right now as a direct result of the cooling of the waters. Fishing should remain very stable until the end of March. The snapper fishing is often done with very light tackle which provides a great challenge to land these wily fish. Come see for yourself why our boats are considered the very best deep sea offshore charter boats in southwest Florida.